Christian taking the information needed for the report. Here we go again. Friday morning started with making an incident report regarding a barley field that had been poisoned. The field belongs to a farmer from Susiya. Today it was to report on demolitions in towns not in our zone but Nassar thought we should go anyway since the EAPPI team from Hebron was not covering it either. The area though has not had too many problems in the past so the demolitions were surprising. The one was a cow barn and factory where cheese was made. The other demolition was a chicken barn. And the third was three sheep shelters. 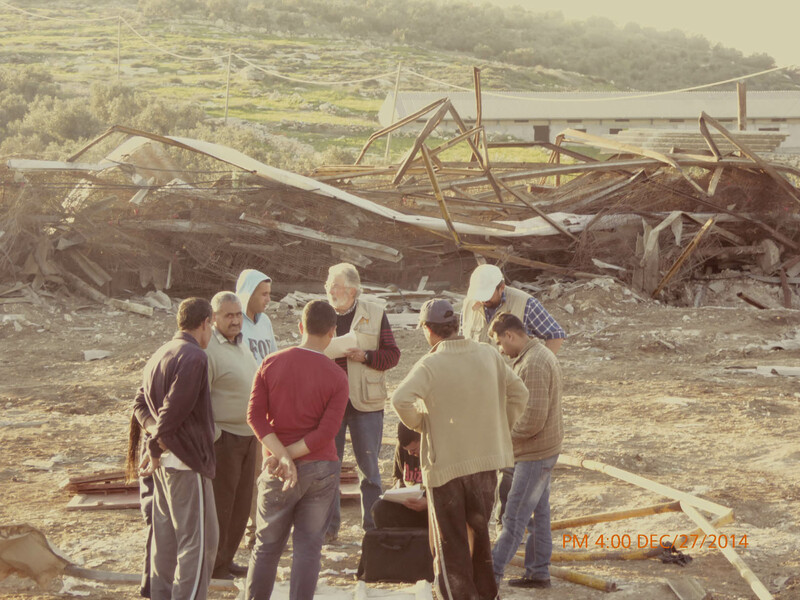 These demolitions were in towns rather than the small bedouin villages that we usually cover here in the South Hebron Hills. These places were also in Area C.
The other lady from the Netherlands who is considering applying for the EAPPI program. 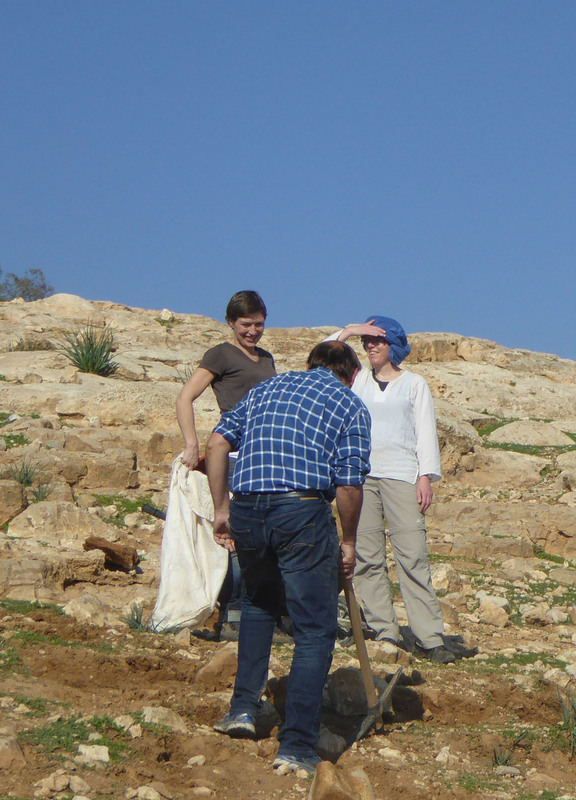 Two women from the Netherlands talking to Craig as he works collecting stones for the floor. We also went to a land action in Um la Kher. There were three women from the Netherlands there as well as people from Taayush. It was to put up a shelter and do the floor. Of course, the military also came to see what was going on. 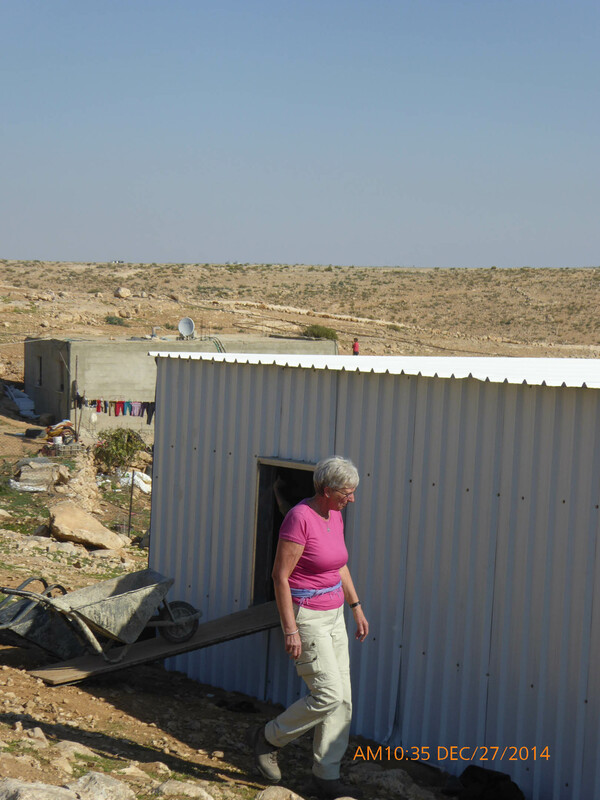 Land actions are done on Saturdays since it is the Jewish sabbath and the DCO is not working. So there can be no stop work order issued and once the building is done, then it can get a demolition order but hopefully it can be delayed by getting legal help, etc. If you work to finish a project that has a stop work order, it can be demolished right away. Posted on December 27, 2014, in December. Bookmark the permalink. Leave a comment.